The word “disciple” refers to a learner or follower. The word “apostle” means “one who is sent out.” While Jesus was on earth, His twelve followers were called disciples. The twelve disciples followed Jesus Christ, learned from Him, and were trained by Him. After His resurrection and ascension, Jesus sent the disciples out to be His witnesses. Peter: Renamed by Jesus to Peter (meaning rock), his original name was Simon bar Jonah;[Mk 3:16] was a fisherman from the Bethsaida “of Galilee”[Jn 1:44], cf. Jn 12:21. Also known as Simon bar Jochanan (Aram. ), Cephas (Aram. ), and Simon Peter. Thomas: Judas Thomas Didymus – Aramaic T’oma’ = twin, and Greek Didymos = twin. Doubting Thomas. James, son of Alphaeus: Generally identified with “James the Less“, and also identified by Roman Catholics with “James the Just“. Thaddeus: In some manuscripts of Matthew, the name “Lebbaeus” occurs in this place. Thaddeus is traditionally identified with Jude; see below. Judas Iscariot: The disciple who later betrayed Jesus. [Mk 3:19] The name Iscariot may refer to the Judaean towns of Kerioth or to the sicarii (Jewish nationalist insurrectionists), or to Issachar. Also referred to as “Judas, the son of Simon.”[Jn 6:71][13:26] He was replaced by Matthias as an apostle shortly after Jesus’ resurrection. It lists “Judas, son of James” instead of “Thaddeus.” In order to harmonize the accounts, some traditions have said that Luke’s “Judas, son of James” refers to the same person as Mark and Matthew’s “Thaddeus,” though it is not clear whether this has a good basis. (For more information see Jude the Apostle). In the Authorized Version of the Bible Luke 6:16 refers to the first Judas (not Judas Iscariot) as the brother of James, not the son of James, but the words “the brother” are in italics in that Bible translation and thus the translators indicated there are no corresponding Greek words for “the brother” in that verse. The wording in Luke may be translated “Simon the Cananean” instead of “Simon the Zealot”. These are generally thought to be the same person. (See Simon the Zealot). The text has some unresolved issues. 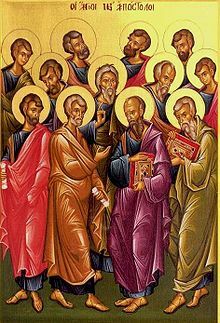 Paul does not refer to “the Twelve” anywhere else in his writings, nor did he ever limit the usage of the word “Apostle” to the Twelve disciples who by definition were the ones appointed as Apostles. Also, by the time Jesus resurrected, the number of Apostles in the Markan tradition should have been down to eleven, since Judas Iscariot was not among them any more. Furthermore, the text seems to have two redundant lists: the first starting with Cephas (Peter) and the second starting with James. Paul would have included Mathias as one of those Twelve who saw the Lord. Remember that they had chosen Mathias based on that the two candidates where there with them from the beginning of the ministry of Jesus. Mathias would have seen the risen Lord. Hopefully, this resolves the “unresolved issue” mentioned above. Christian tradition has generally passed down that all but one were martyred, with John surviving into old age. Only the death of James, son of Zebedee is described in the New Testament, and the details of the other deaths are the subject of pious legends of varying authenticity. In some cases there is near unanimity in the tradition, and in other cases, there are widely varying and inconsistent accounts. Judas Iscariot, originally one of the Twelve, died after the death of Jesus. Matthew 27:5 says that he hanged himself, and Acts 1:18 says that he fell, burst open, and his “bowels gushed out.” Matthias was elected to take his place as one of the twelve. Peter, crucified upside-down in Rome c. AD 64. John, son of Zebedee, no biblical record of death, he is believed to have died of natural causes due to old age. Members of The Church of Jesus Christ of Latter-day Saints believe that John was immortalized and he will live to see the Second Coming of Christ. Andrew, Peter’s brother, was crucified upon a diagonal or X-shaped cross. Matthew killed by an axe in AD 60. Judas Iscariot, according to Matthew, hanged himself after betraying Jesus. In Acts, he is described as falling in a field and bursting open. Apologists explain this apparent discrepancy by presuming that he fell from the tree he was hanged on after decomposing for some period of time which caused him to burst open upon impact. Matthias, Judas’ replacement, was stoned and beheaded. In Rom 16:7 Paul states that Andronicus and Junia were “of note among the apostles,” subjectively this has been traditionally interpreted in one of two ways: 1) That Andronicus and Junia were “of note among the apostles,” that is, distinguished apostles. 2) That Andronicus and Junia were “well-known among the Apostles” meaning “well-known to the Apostles”. In the first view it is believed that, Paul is referring to a female apostle. Unhappy with reference to a female apostle, editors and translators have often changed the name to “Junias,” the masculine version of Junia, as in the Revised Standard Version. While “Junia” was a common name, “Junias” was not. This alteration is part of a pattern by which later editors changed Paul’s epistles to make them less favorable toward women in positions of authority. Historically it has been virtually impossible to tell which of the two views were correct. The second view has however, in recent years, been defended from a scholarly perspective by Daniel Wallace and Michael Burer. Following a careful examination of this Greek phrase (episēmoi + the preposition en) in biblical Greek, patristic Greek, papyri, inscriptions as well as Hellenistic and classical Greek texts, they convincingly reveal that the normal way one would attempt to convey the meaning ‘to the Apostles’ rather than ‘among the Apostles’ was employed by Paul. Thus, revealing the second interpretation to be correct. Silas is referred to as an apostle in 1 Thes. 1:1 and 2:6 along with Timothy and Paul. He also performs the functioning of an apostle as Paul’s companion in Paul’s second missionary journey in Acts 15:40ff. Timothy is referred to as an apostle in 1 Thes. 1:1 and 2:6 along with Silas and Paul. However, in 2 Cor. 1:1 he is only called a “brother” when Paul refers to himself as “an apostle of Christ”. 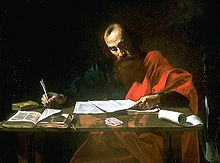 Timothy performs many of the functions of an apostle in the commissioning of Paul in 1st and 2nd Timothy, though in those epistles Paul refers to him as his “son” in the faith. Apollos is included as “us apostles” in 1 Cor. 4:9 (see 4:6, 3:22, and 3:4-6) along with Paul and Cephas (Peter). This entry was posted on Thursday, March 31st, 2011 at 10:12 am and is filed under Apostles, Bible, Desciples, Inspirational, King James Version Bible, Religion Today, Religious. You can follow any responses to this entry through the RSS 2.0 feed. You can leave a response, or trackback from your own site.